Ok so you have a descent camera, a light box, and nice looking models you want to share with world. Now what? Well for me I spend a few minutes to edit each picture before posting it online. This is an open source (and free) version of Photoshop that can do way more than I will ever need but it does the things I do need very well. For this tutorial I will go over cropping and white balance. There may be ways to take the perfect picture so that you don’t need to crop out the extra white space but I find that if I zoom in to the point the model fills the screen the depth of field is too narrow and much of the model is blurry. 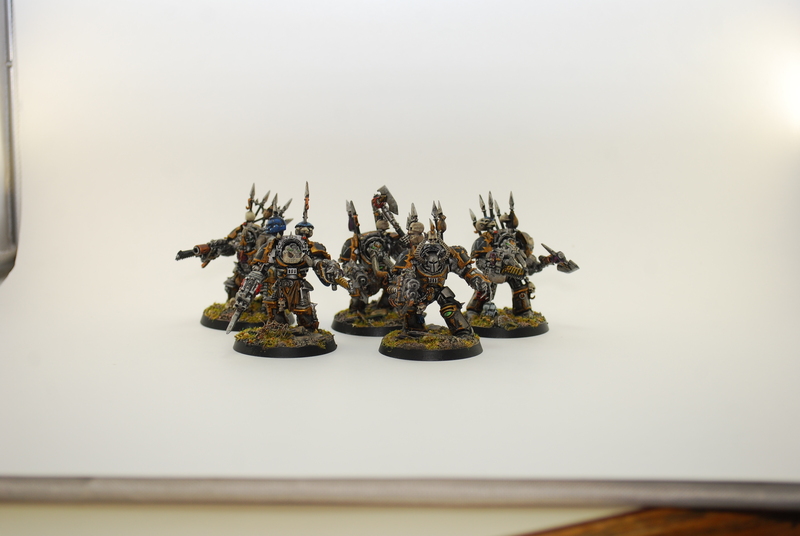 Below is a pre-cropped image from my light box from my recently finished terminator squad. This is an easy fix in GIMP: click on the rectangular select tool and drag it so it roughly contains your model. Now there should be a dotted box around your model. If it doesn’t fit just right you can click inside the box and move your cursor towards the edge you want to move in or out until a box appears on the edge. You can then click and drag this box to move the edge of your selection. Once you have the perfect fit click on Image->Crop to Selection. Just by removing most of the extra white space around the models they present better and the viewer can focus on the models rather than try to pick them out of the sea of whiteness. This not only makes the contrast between light and dark clearer but also makes the colors more vibrant but is not completely perfect. In the picture above you may notice that the white background has a somewhat blue hue to it. Not a big deal but it does mean that the auto balance didn’t quite get it. To fix this you can manually adjust the white balance using the Levels tool. In the picture above I reset the auto balance to make the changes more apparent but I’ll often use the auto adjust and then fine tune it with the levels tool. The Levels tool window shows a histogram of the various shades from black to white. As you can see there is a large peak near the upper side that corresponds to the large amount of white in the picture (the poster board) but is not actually at the edge of the graph. To fix this you can click on the eye dropper underneath the gram on the right side. The tool tip will call this the ‘Pick white point’ button. Your cursor will then turn into the tear dropper, click it on your picture where you want to designate to be pure white. Try clicking it in various parts of the models too to get an idea of what it is doing. You can see that it instantly brightens the picture but may wash out some of the depth. To fix this we may need to adjust the black level. You can try to use the ‘pick black point’ button like the white one above but I find this doesn’t often work as well. Instead try grabbing the small, black triangle under the graph and slide it to the right. You probably won’t need to go to far before seeing the difference. Here it is a mater of balance between showing details in the darker areas, or giving a more realistic shadowing. You now have a nice, cropped and white balanced picture for others to enjoy. Further steps may include adding a ‘watermark’ to the image or overlaying it into a neat background. I hope you found this tip helpful and let me know if you have any photo editing tips you would like to share.